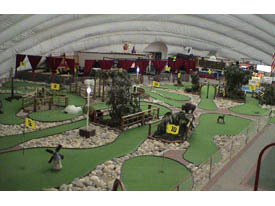 The Golf Dome's 18-hole indoor miniature golf course is both fun and challenging. Both serious and recreational golfers of all ages enjoy the course. And, of course, mini-golf is always a hit with the children! The miniature golf course is open year round, and can be utilized for birthday parties as well as other private functions. The golf course is a perfect place for some friendly competition. Challenge a friend or family member to a round of miniature golf today. The course takes approximately 30 – 45 minutes to complete, depending on volume, and if rules are followed, etc. The course operates on a first come, first serve basis. No need to call ahead unless you are bringing a group of 10 or more.